"Fighters have rules, too: friendship, trust, integrity. Without rules, we wouldn't survive for long." Crouching Tiger, Hidden Dragon (Wo hu cang long) burst onto cinema screens around the world in the year 2000, introducing a wider audience to the style pioneered by the Hong Kong film industry. The film became the highest-grossing subtitled film to date in the United States, a stunning adventure filled with dazzling fight sequences, rich characters and an emotional depth unseen in American "action" movies. (For more information on the film and its storyline, see our own Dan Heaton's review of the original DVD edition.) The positive box-office response to Crouching Tiger and the Jackie Chan releases helped to open the Western cinema to Eastern aesthetics and productions; witness the upcoming wide release of Wo Ping Yuen's 1993 opus, Iron Monkey. Some long-time fans of the Hong Kong genre have dismissed Crouching Tiger, Hidden Dragon as a johnny-come-lately effort that caught the attention of critics and audiences, thanks to savvy marketing and timing. The point has some merit, but to suggest that, say, The Heroic Trio is equivalent to Crouching Tiger is to ignore Ang Lee's considerable achievement here. The combat scenes are gorgeous and freewheeling, eschewing naturalism in favor of a balletic approach that combines intense hand-to-hand combat with a hovering, pseudo-magical approach to the staging. Action choreographer Wo Ping Yuen uses "wire-fu" rigs and trick photography to enable the actors to float across rooftops, leap across vast spaces, and run up walls with the greatest of ease. Bodies and weapons fly, spin and float in brilliant defiance of the laws of physics; the fights are poetry in motion, as beautiful as they are exciting. What strikes one most on repeated viewings is the story's emotional richness. Mature warriors Yu Shu Lien (Michelle Yeoh) and Li Mu Bai (Chow Yun Fat) suffer self-imposed deprivation, barely cognizant of their deep love for one another. Lien attempts to impart her wisdom to the young Jen Yu (Zhang Ziyi), an exceptionally skilled young fighter forced into a political marriage as she yearns for her desert bandit lover, Lo (Chen Chang). There are layers of feeling here that become more evident as the plot becomes more familiar—the lead performances are full of nuance and repressed feeling, and the heart-rending climax becomes more painful with each viewing. Even the witch-warrior villainess, Jade Fox (Pei-pei Cheng), is a sympathetic character in her way, twisted by hatred and envy but recognizably human. Director Ang Lee knows how to handle actors, female characters in particular, and his considerable skills make the film much more substantial than it might have been. Crouching Tiger, Hidden Dragon is one of those rare, near-perfect films that strikes every note with style and confidence. The production design establishes an otherworldly fairy-tale China that makes every building and costume seem fresh. The story is entertaining and satisfying, the martial-arts action enthralling and the emotions honest and deeply resonant. Crouching Tiger, Hidden Dragon transcends its genre while reveling in its conventions; a fine introduction to the Hong Kong style, and an important film in its own right. Recommended. Image Transfer Review: This "Superbit" edition improves slightly on the video quality of the original DVD release, retaining the 2.35:1 widescreen theatrical aspect ratio with a solid anamorphic transfer. Unfortunately, the picture isn't perfect�the source print exhibits more dirt than is usual for a film of such recent vintage, and there's some grain shimmer apparent in out-of-focus areas of certain shots. The subtitles also drop down below the bottom of the widescreen image, an annoyance for those who would prefer to matte the image to the film's aspect ratio. It's still a fine transfer, capturing the film's rich paper, fabric and architectural textures, with minimal edge enhancement, naturalistic color and subtle shadow detail. Those who were disappointed with the original release's quality may appreciate the subtle improvements afforded by the "Superbit" format�but it's not as impressive as the label would imply. Audio Transfer Review: Crouching Tiger, Hidden Dragon includes two 5.1 soundtracks, in Dolby Digital and DTS formats. Fortunately, Columbia TriStar's "Superbit" standards insist on original language audio, so the English dub included on the original DVD is not included here. As with some other "Superbit" releases, no DTS track was prepared for the film's theatrical exhibition, and the DTS mix included here appears to be a reformatted version of the original Dolby Digital presentation. The DTS track is noticeably louder than the Dolby Digital mix, but both tracks are similarly impressive, with broad frequency range, impressive dynamics and finely-rendered dialogue and sound effects. The mix is fairly front-oriented, with little front/back panning, the surrounds being responsible primarily for atmospherics and musical envelopment. A fine audio presentation, certainly worthy of the "Superbit" designation. Extras Review: The "Superbit" series eliminates extras in favor of maximum data space for audio and video, and Crouching Tiger, Hidden Dragon is no exception. Twenty-eight picture-menu chapter stops, simple menus and subtitles in 7 languages are the only features provided. Note that the disc does NOT provide any subtitles by default—unless you are fluent in Mandarin, you'll need to visit the setup menu to turn on the subs in one language or another. The original release included some significant extras, dropped this time around for the sake of bandwidth. The technical reasoning is sound, but some will find the trade-off unappealing, given the minor audio/video improvements in this case. The disc itself has a minimalist look, with simple red/white copy and no colorful artwork; on the positive side, the layer change is VERY well-disguised. 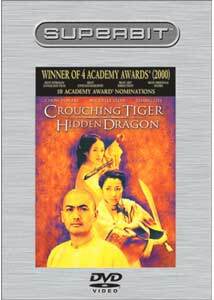 Columbia TriStar's premium "Superbit" series marches on with this re-release of Ang Lee's martial-arts masterpiece, Crouching Tiger, Hidden Dragon. It's a visible improvement over the earlier, lower-bandwidth release, but the differences aren't dramatic, and the absence of extras should be taken into account when considering the "enhanced" value of this edition. It's still a fine presentation of a great movie.